No one is sure about who exactly initiated Memorial Day. Here’s one story. Boalsburg, Pennsylvania (off Route 322 in the foothills of the Alleghenies of Centre County), boasts the origin of Memorial Day. The story (apocryphal or true) is that on a pleasant Sunday morning in October of 1864, Emma Hunter and Sophie Keller were placing flowers on the grave of Emma’s father, Dr. Reuben Hunter, a surgeon in the Union Army, when they met Mrs. Elizabeth Meyer who was placing flowers on the grave of her son Amos, a private in the Union Army who was killed on the last day of the battle at Gettysburg. They decorated the graves of each other’s kin and gave birth to Memorial Day originally called Decoration Day. Gaining adherents, on May 5, 1868, General John A. Logan, commander-in-chief of the Grand Army of the Republic, proclaimed May 30, 1868 as a day for decorating the graves of those who died in defense of their country. In 1882, the event was designated as Memorial Day and later broadened to include any American who had died in war or peace as soldiers or civilians, to which Oliver Wendell Holmes wrote: “One flag, one land, one heart, one hand, one nation evermore.” In May of 1966, President Lyndon Johnson recognized Waterloo, New York, as the “official” birthplace of Memorial Day. What does Memorial Day mean for American Hispanics? Memorial Day should give us pause to remember that American Hispanics have been part of the United States since its founding and that American Hispanics have fallen in every American war in defense of the nation [see Hispanics in America’s Defense, Department of Defense]. American Hispanics fought in World War I, the Spanish-American War, the Civil War, the War of 1812, and the American Revolution, and countless other skirmishes including the present day conflagrations in Bosnia, Afghanistan, and Iraq. Many historians point out that without Spain’s help the American colonists could not have won their independence. Hispanics have been America’s strongest supporters and allies. is therefore fitting to honor their memory and their place in our lives and in our history. In 1776 Hispanics (Sephards) were part of the founding of the United States, having become part of the American population when the Dutch colony of New Amsterdam (of which they were a part) became New York. When the United States acquired the Louisiana territory and New Orleans, the Hispanic citizens of that purchase became Americans (having been French briefly when Napolean acquired the territory from Spain). And again when the United States acquired Florida in 1819, the Hispanic settlements of that region became Americans. Hispanics are not newcomers in the United States. They have been part of the American fabric since the beginning. The largest number of Hispanics who became Americans by fiat were the Mexicans who were part of the Mexican Cession—that territory of Mexico annexed by the United States as a prize of the U.S.—Mexico War of 1846-1848. The territory dismembered from Mexico was larger than Spain, Italy, and France combined. In part, we are the progeny of that “conquest generation” that endured the slings and arrows of outrageous fortune. Like other “territorial Americans” (Native Americans, Mexican Americans, Pacific Islanders), the United States came to Puerto Ricans, they did not come to the United States. Territorial Americans are Americans by fiat—they came with the territories acquired by the United States by force of arms and conquest. Despite the travails of life in their own lands as strangers, Hispanics have answered the nation’s call in times of peril. During World War II, they served in numbers greater than their percentage in the American population. More than 700,000 Hispanics were in uniform during World War II, most of them Mexican Americans. As a group they won more Medals of Honor than any other group. This is the history we must remember and honor; and why we ought to decorate the graves of those who shaped our present. More importantly, however, we ought to extract from that me-mory, the most important lesson of history as George Santayana, the eminent American Hispanic philosopher, put it: those who cannot learn the lessons of history are condemned to repeat it. Por eso nos recordamos de nuestros valientes militares y nuestros antepasados en este dia de la memoria—Memorial Day! This is the history we must remember and honor; and why we ought to decorate the graves of those who shaped our present. More importantly, however, we ought to extract from that memory, the most important lesson of history as George Santayana, the eminent American Hispanic philosopher, put it: those who cannot learn the lessons of history are condemned to repeat it. Want to know how many Texas college students are enrolled part time or how many are prepared for coursework when they start university or community college? For those pondering these topics, the answers are now available in the second edition of the Texas Public Higher Education Almanac that was released Tuesday. This year's almanac, which is available on Texas Higher Education Coordinating Board website, details a variety of data and aims to provide the public a snapshot of how the state is performing on the higher education front. State and national data about college tuition, access and completion is documented in the almanac. "It's a living, breathing document," said Dominic Chavez, spokesman for the coordinating board. 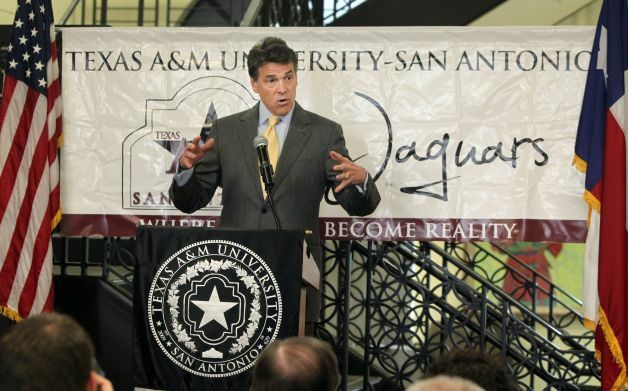 The 2012 almanac was announced at a press conference held at Texas A&M University-San Antonio Tuesday. Gov. Rick Perry and Texas Higher Education Coordinating Board Chairman Fred Heldenfels IV described the efforts as a way to promote transparency and accountability. "Access to a college degree is more critical than ever, and we must maintain our dedication to transparency, which is essential to making higher education more affordable, accountable and accessible to Texas students," Perry said in a release detailing the event. "This almanac is an important tool in those efforts, not only because it offers transparent data that is valuable to a student in the process of choosing a school, but also because it holds our colleges and universities accountable as they pursue efforts to improve their graduation rates, create more affordable degree options and achieve standards that will keep our state a leader in higher education." Chavez added that the almanac is a work in progress as it is improved to include more data and changed to reflect current concerns. For example, this year's almanac includes part-time student performance and how graduation rates have improved over time. The almanac also has several topical pages that reflect current higher education concerns, including developmental education, graduation success, transfer trends and finance. The idea is to make the information accessible to policy makers, educators, parents and students, Chavez said. This year, the effort goes more grassroots as the coordinating board works to get the almanac in the hands of school district superintendents. Texas ranks 35 nationwide in the percentage (49.6 percent) of students who graduate in four years from an institution. Texas ranks 28th nationally in the attainment of Bachelor's degrees. Texas ranks 27th nationally in average tuition at public, four-year institutions ($6,350). Fifty-seven out of every 100 Texas public university students earns a degree within six years. Forty out of every 100 students, who are college ready when they start at a two-year institution, graduate or are still enrolled after three years. Seventy percent of students enrolled at public community colleges were enrolled part time. Daniel Formanowicz, former chair of the UT System faculty advisory council and a biology professor at the University of Texas at Arlington, said the more information about higher education available to the public, the better. He said providing information about part-time students gives people a fuller picture. "I see that as a positive thing," Formanowicz said. The almanac's release coincided with a directive from Perry to the coordinating board to follow up with state colleges and universities to see how they are progressing in implementing previously recommended cost efficiencies. Among recommendations are that higher education institutions improve credit hours produced per full-time faculty member by 10 percent. That move would save an estimated $255.3 million over four years. The report also suggests institutions should evaluate e-textbooks to se if they are more affordable to students and institutions and how they impact learning. Formanowicz said every Texas institution is dealing with cost savings as they see less state dollars and more students. "We don't really have a choice. We have got to get more efficient," he said. The cost savings issue, along with creation of undergraduate programs that cost no more than $10,000, was highlighted Tuesday. Texas A&M University-San Antonio has created a $10,000 Bachelor of Applied Arts and Sciences degree program that focuses on information technology and includes dual credit coursework at the high school level, said Jillian Reddish, a spokeswoman with the campus. Perry touts higher ed accountability, responds to rumors: Political attack on universities denied. Gov. Rick Perry, in town Tuesday to talk about accountability in higher education, found himself addressing questions about his influence and direction of higher education policy. In prepared remarks before other education leaders at Texas A&M University-San Antonio, the governor touted the second edition of the Texas Public Higher Education Almanac, a compilation of statistics — tuition and fees, enrollment, graduation rates and other details — that was released Tuesday. Perry said the almanac will send a message to employers that Texas has a skilled workforce and will give young people the data they need to choose the right school and maximize their potential. The almanac is available online at www.thecb.state.tx.us/almanac. But Perry had to veer off the topic when asked about recent controversies involving the University of Texas System Board of Regents and a comment made Monday by Bexar County Judge Nelson Wolff, who opined that higher education in Texas is under political attack. A recent blog post from Paul Burka, senior executive editor at Texas Monthly, stated that University of Texas at Austin President Bill Powers could lose his job after opposing the regents' decision to impose a two-year freeze on undergraduate tuition for state residents there. On Tuesday, Perry said he agreed with the regents' decision. Support for Powers has flowed in recent days from UT students and faculty. Michael Morton, a student and president of UT Austin's Senate of College Councils, said he believes the threat to Powers' job is real and continues. 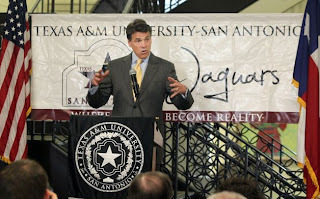 During Perry's visit to San Antonio, he also disagreed with Wolff's statement that there has been a coordinated attack on higher education in recent years. Wolff's comment came during a San Antonio Express-News editorial board meeting in which he supported the University of Texas at San Antonio's campaign to become a major research university despite cuts in state funding. Interactive: How Much Does Your Superintendent Make? During the 2011 legislative session, amid a heated conversation among state lawmakers about whether Texas public schools spent too much on administration, the Texas Tribune published a salary database of the state’s highest-paid school administrators: superintendents. With a new person in the top post at Alief, that district, whose superintendent used to be the second-highest paid in the state, has dropped to 22nd on the list. The former third and fourth top-paying districts, Dallas and Fort Worth, have both installed new chiefs at lower salaries than their predecessors, leaving Spring Branch’s Duncan Klussmann in the second spot at $309,400. Unsurprisingly, the superintendents of districts with the smallest enrollments tended to have the highest per-student pay. There are 15 superintendents in the state that make more than $1,000 per student — and the largest of them has 113 students. But Eric Stoddard of West Texas’ San Vincente ISD took home that superlative with a $1,500 lead over the next in line. As chief of a district with 16 students, he makes $91,670 a year — that’s $5,729.38 per student. Texas Education Agency Commissioner Robert Scott is leaving the post Gov. Rick Perry appointed him to in 2007. When Scott steps down on July 2 from the agency that oversees the public education of Texas' nearly 5 million students, he will be the longest-serving education commissioner of the past two decades. Scott said in a statement that it had been a "privilege" to serve at the agency and noted that he began his career there in 1994 — when his son was one and his daughter was 3 months old — and they have both now gone on to graduate from Texas public schools. Texas was often at the center of national conversations on education matters during his tenure — skirmishing with the Obama administration over Race to the Top and other federal policy and making deep reductions to public education funding. More recently, Scott drew fire over his remarks suggesting Texas needed to reform how it uses standardized testing to hold schools accountable. During the past legislative session when the state cut public schools by more than $5 billion, Scott often found himself having to both reassure educators that they would be able to make do with fewer resources and ask lawmakers for more funding. Asking what parts of the education budget should be funded, he once told senators during a hearing, was akin to asking "a guy on the operating table whether wants his heart or his lungs back." 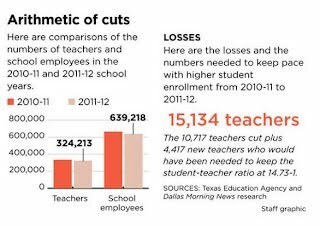 Texas schools have lost more than 25,000 employees in the year since lawmakers slashed the education budget — and to absorb its own state budget cuts the TEA has dropped a third of its staff. Though the speech marked his strongest comments on the subject to date, it was not the first time Scott found himself navigating a controversy on how standardized exam scores factor into state accountability ratings. Last May, the agency discontinued the use of a mechanism in the ratings called the "Texas Projection Measure," which critics said artificially inflated students' test scores by inaccurately taking into account their future performance. The move came after a year of outcry from lawmakers and a unanimous vote against the measure on the House floor. Under Scott's watch, Texas also became one of the first states to refuse federal Race to the Top funding, which he said at the time would have imposed too many burdens on schools, including forcing them to adhere to national common core curriculum standards. Before his appointment, Scott served as TEA's acting commissioner twice and served four years as chief deputy commissioner, managing daily TEA operations. He previously served as senior policy adviser to Perry and is credited with helping pass and implement the Texas High School Initiative in 2003. In a press release, Perry praised Scott's performance at the agency.